Cold black bean salad with a bite! 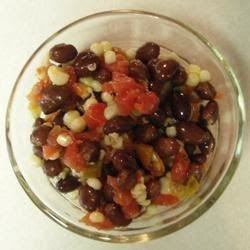 It makes a great side dish for any Mexican or Southwestern dish. This recipe has become a healthy favorite in our family. Adjust the amount of serrano pepper to suit your spice tolerance.